What’s better than sipping a good paloma while relaxing to the sounds of the sapphire-blue waves on a secluded beach only reachable by boat? How about a freshly baked pie made with fruit gathered just a few hundred feet away? Yelapa, a tiny beach community about 45 minutes away from Puerto Vallarta via water taxi, is known for its tropical pies. 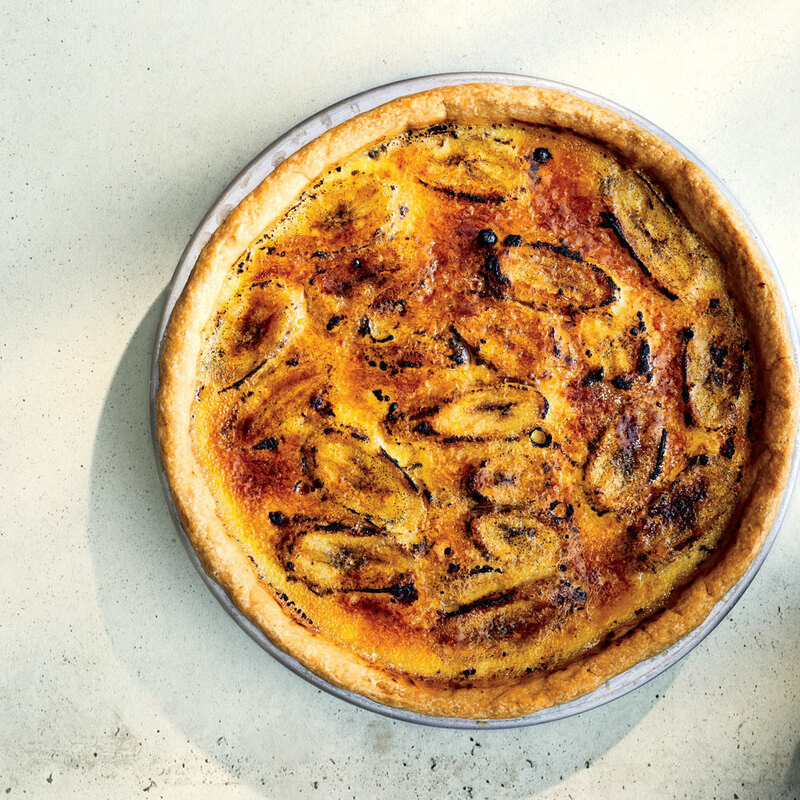 This version from Javier Cabral and Paola Briseño González features caramelized bananas and vanilla custard. The sturdy crust is salted and shortbread-like because the pie has always been eaten while sunbathing, with no utensils around. Take big bites—it’ll taste better. Preheat oven to 375°F. Whisk together flour and 1/4 teaspoon salt in a medium bowl, and make a well in the center. Set aside. Combine butter, shortening, and 1/4 cup water in a small saucepan. Cook over medium-high, stirring constantly, just until butter and shortening are melted, about 2 minutes. Bring to a gentle simmer, and cook 30 seconds to 1 minute. Pour butter mixture into well in center of flour mixture. Working quickly, use a rubber spatula to stir mixture until a shaggy dough forms. Transfer dough to a clean surface, and knead until smooth, about 1 minute. 2. Combine butter, shortening, and 1/4 cup water in a small saucepan. Cook over medium-high, stirring constantly, just until butter and shortening are melted, about 2 minutes. Bring to a gentle simmer, and cook 30 seconds to 1 minute. Pour butter mixture into well in center of flour mixture. Working quickly, use a rubber spatula to stir mixture until a shaggy dough forms. Transfer dough to a clean surface, and knead until smooth, about 1 minute. Place dough between 2 sheets of parchment paper, and roll into a 12-inch (1/4-inch-thick) circle. Remove top sheet of parchment; discard. Use bottom sheet of parchment to lift up dough circle, and carefully flip dough over into a 9 1/2-inch deep-dish pie plate. Remove and discard parchment. Patch tears in dough, if needed. Line pie dough with parchment, and fill with pie weights. Bake in preheated oven until crust is set, about 18 minutes. Remove pie weights and parchment, and continue baking, pricking crust with a fork to deflate bubbles if needed, until crust is lightly browned, about 15 minutes. Transfer piecrust to a wire rack to cool completely, about 45 minutes. Reduce oven temperature to 325°F. Line piecrust with banana slices. Whisk eggs in a medium bowl until completely blended. Add milk, condensed milk, vanilla bean seeds, and remaining 1/4 teaspoon salt; whisk until combined. Carefully pour milk mixture over bananas. Bake at 325°F until edges are set and center is slightly jiggly, 45 to 50 minutes. (Banana slices will rise to top during baking.) Transfer pie to a wire rack to cool. If desired, sprinkle sugar evenly over top of pie. Using a kitchen torch, caramelize sugar. Serve immediately, or chill overnight. Review Body: Steps 2 &amp; 3 are identical. Ignore one of them and just go ahead. Review Body: Somebody needs to edit this recipe. If you read it, you will see the mistake. Review Body: The crust was crumbly and I never did get it smooth so I patted it into the pie pan and it turned out fine. A regular 9-inch pie pan is too shallow to hold all the milk mixture so next time I'll make it in a deep dish pie pan to get all that yummy custard. Review Body: Looks delicious. I have fond memories of Yelapa and especially the COCONUT PIE which was out of this world! Have been trying to find or duplicate that recipe but have never gotten it exactly like I remember it. Perhaps Messrs. Javier Cabral and Paola Briseño González know the recipe and would be willing to share it. Thank you.